I installed a pair of yellow rotating flashing lights on my crawler that work fine until I turn the wheels. It seems like a voltage issue? I'm using 2S Lipo 35C. I've plugged the two lights through a 'Y' harness into channel 3 and 4 of the receiver with no change. Should I just run them off their own power supply? Removing the 'Y' harness and plugging one light into channel 3 and the other into channel 4 didn't help either. Last edited by Spock021; 01-25-2018 at 08:25 PM. Well first , what are the specs on the lights....operating voltage, amp draw, etc, etc...? They probably draw more than what can be supplied through the receiver port(s) when the servo is under load. 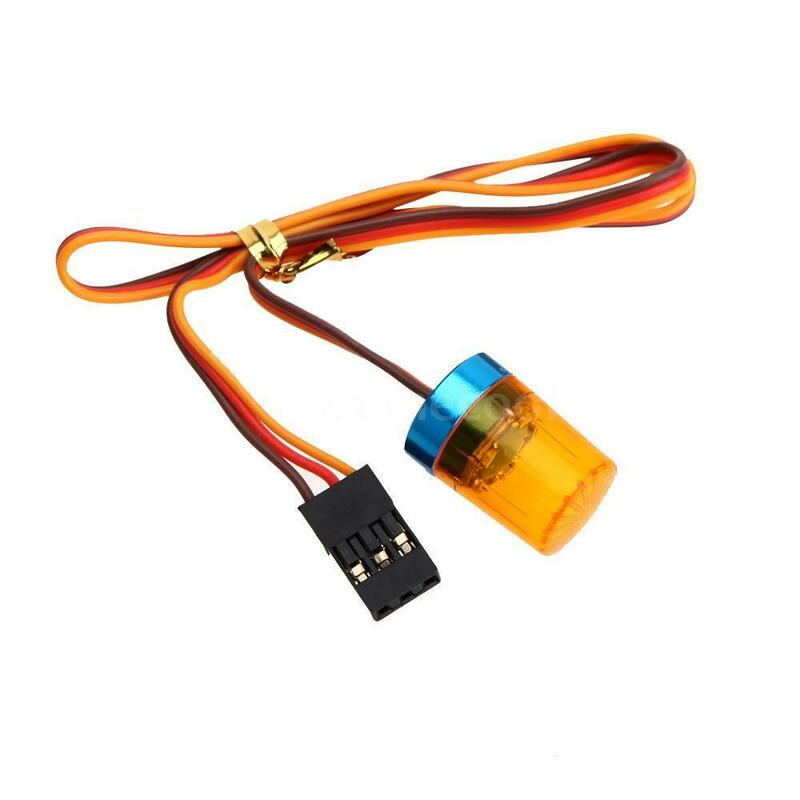 I would wire them directly to the ESC connector via a switch so they can be powered directly from the 2 cell LiPo. Install a small 2 cell 1500mah pack and wire it directly into the lights. Again, this all depends on what the specs of the lights are. What ESC's output spec and light's voltage requirement? Without knowing about power requirements...I'd try running the lights straight off the main battery, or using a seperate BEC. The rotating/flashing lights come with 3 wires so they can be controlled from the radio through the receiver (on/off and fast or slow rotating). My current radio only controls 2 channels, so I was plugging the lights into the receiver just to get power. Tonight I tried powering the lights from a separate pack of 4 AA batteries with just two wires (red and black). Not only was I unsuccessful in even lighting the lights, but now when I went back to plugging the lights into the receiver, the two lights light up only one of the five leds each and don't 'rotate' at all. Just to test the signal wire on the controllable lights, I'd plug the lights into channel 1 on the receiver and try to control the lights with your transmitter's steering wheel/stick. Link to the light set you have? Okay will give that a try. Possibly by cutting just the signal wire of the three wires it would just go back to rotating/flashing without reacting to random 'signals'? That's all I want it to do. Wow! can't believe the link info that I captured from eBay for my truck lights., and this site doesn't allow me to post URLs until I have at least 10 posts anyway. If you just searched for AX-501Y on eBay you will see the yellow lights I purchased. These are cheaply made chicom lights and anything could be wrong with them. If the vehicle battery is good and the esc is good and if you plug one light into a spare receiver port and it does not light then the light is probably broken. Plugging it directly into a 4.8 or 6 volt battery will prove if the light is good or bad. The signal wire is probably only used to change the flashing sequence .........when they are working correctly. Last edited by flyinwalenda; 01-28-2018 at 08:49 AM. This one...AX-510Y RC Multi-function Circular Ultra Bright Police Car LED Yellow? Here I was thinking some type of mechanical/physical motor used inside of lens to rotate a reflector. The one pictured below looks like it uses a seperate LED to get the rotating effect. Are they like this one in video? Before cutting signal wire, I'd pull the female signal connector out of the plug so that you have only the positive and negative wires in the light's plug. I use an X-acto knife to do this task of lifting the small tab on plug. Last edited by RustyUs; 01-28-2018 at 09:42 AM. Well, I made a newbie mistake and reversed the polarity when trying to run the lights on a 6 volt (4 AAs) input for just the lights. Shorted one of them out I believe. Both the battery pack and the lights came with female connectors, I made up a short wire jumper to plug into these for the test but didn't notice the all black double wires out of the switch on the power pack were twisted inside the switch. So now I'm down to one working flashing/rotating light, (and it might also be suspect now). But it seems to be acting like originally where it 'rotates' the 5 led flashes until the steering servo is activated, at which point it locks up. I think I will order one replacement yellow light and a male to male jumper for the battery box and proceed from there. These are cheap China items and anything could be going on. Hopefully, separating them from the truck's internal systems (ESC, receiver) should reduce the variables.Today I am changing to a new 4 channel receiver and 4 channel radio. Might plug in the one working light to see if it changes anything. Surprise, surprise! I changed to a new rx/tx and plugged in the one remaining working light and it works fine, with no interference when I turn the wheels. So I have one light happily 'rotating/flashing', and a new set on order to replace the shorted out one. Haven't got the 3rd or 4th channel to control the light's flashing yet, but that could be my new radio learning curve; or the damage I did by accidentally reversing the polarity.